Welcome to my blog where you will find many different aspects of my artwork. Please feel free to look around at all the exciting things happening here at Aartvark Cre8tions. Another day at the Art Bar yesterday. In keeping with the theme of Halloween this Friday, we drew and tangled a Halloween Pumpkin. Tangles used were Vache 1, Diva, Web, Candy Corn, and Barbz. We also share some variations on tangle patterns that could be used for Halloween patterns, like Tripoli for the Candy Corn. In the pumpkin, Nzepple was used to make the candy corn. Diva for the tree in my pumpkin on the left. For added effect, Hollibaugh for the bones. Just curve the ends and you've got bones. 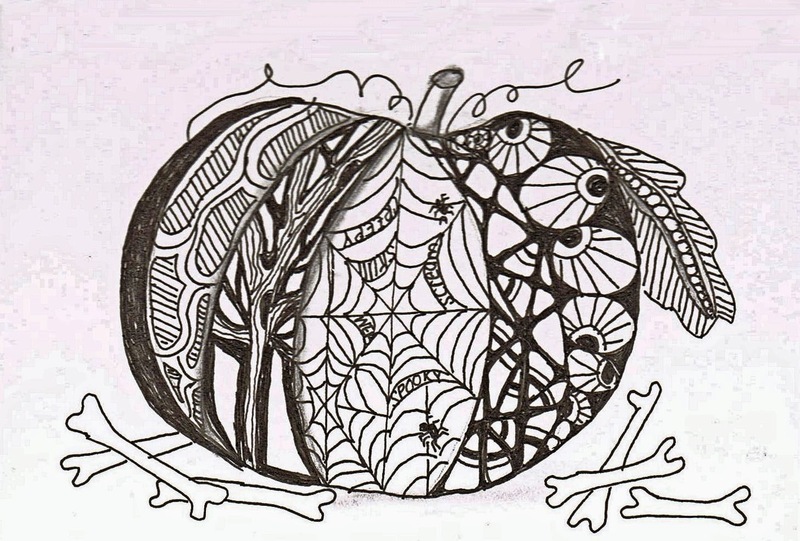 What tangle patterns can you vary to come up with for Halloween patterns? Deborah A. Pacé is an award winning Multi/Mixed Media Artist & Workshop Instructor. She is a Certified Zentangle Teacher & Sulky Instructor. Deborah has been published in two North Light Books: “ZenDoodles: Tons of Tangles” and "ZenDoodles: Oodles of Doodles. Her illustrations and art work have been featured in Cloth Paper Scissors Magazine, "Zendoodle Workshop". She started in Fashion at the age of 12 & from there her interests & talents grew. She is not only a quilt artist & designer, but a fiber artist as well. Along with quilting, Deborah makes & sells jewelry & paper art. She is currently working on designing a Tangle Pattern Market Bag for sale in the near future. Her interests are always growing & she is always working & experimenting on new designs & learning new techniques. Deborah is a member of Toastmasters, Quilt Visions, WAC (Wearable Arts Connection), & volunteers at Steven’s Hope for Children. You can contact Deborah at dpavcreations@gmail.com or 909-702-8964.